Ok, you just got off the phone and your client is jazzed about your offerings. You feel it in your bones that this will be a quick sale and a good project for your business. What’s your next step? How do you continue the momentum? How do you create a sense-of-urgency yet still look professional? You need Quote Roller, our online proposal solution for pretty much any business out there, big or small, to quickly deliver your sales quote to your customer. 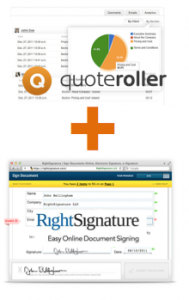 You need RightSignature, a fully integrated online electronic signature software application. Quote Roller brings you one of the most needed and fully-integrated solution anytime. Anywhere. Learn more about our latest integration into RightSignature or visit our integrations page here.